The idea that magical creatures inhabit the world around us is a fun one. The idea that they inhabit their own world that parallels our world is even funner. In Null Faeries #1 from Action Lab Danger Zone, faeries are fighting for survival--both against our world and themselves. The issue is written and illustrated by Chad Cicconi, colored by Eddy Swan and lettered by Adam Wollet. Ionantha Hesperis was the greatest of all the Queen's Harvester Faeries when she was felled by a cursed Fey blade and stripped of her magic powers. Forgotten, but bitterly refusing to die, she learned to exist on cunning, an aging mortal within an immortal society fueled by magic she could no longer taste. But when the queen's pixie dust shipment is hijacked, putting the entire magical economy at risk, Ionantha is summoned into service once more and tasked by a vengeful Queen with solving the case of the century. Cicconi is touching on an interesting concept in analyzing some of the daily minutia and politicking that seems to affect even the world of Faeries. Ionantha is presented as a powerful character who just happened to be at the wrong place at the wrong time, but Cicconi relies on her persistence as a means of carrying on the story. The issue is also jam-packed with dialogue that effectively introduces the reader to the aforementioned world, offering plenty of substance in the universe for the characters to play in. 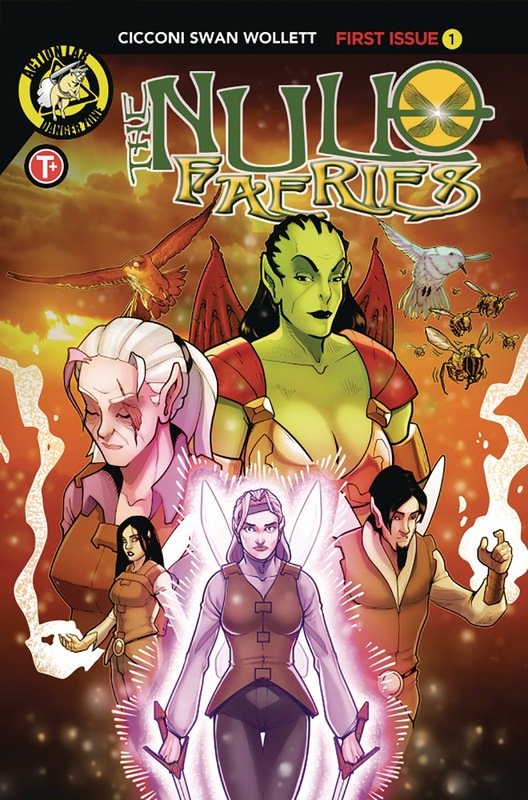 In fact, most of the issue is spent on explaining the world that the faeries inhabit and the mystery behind the theft of the pixie dust shipment is sort of left hanging (at least in the first issue). The end of the issue offers a cliffhanger for sure, but it's not necessarily tied in tightly with the story as a whole. The artwork is pretty solid throughout the issue as Cicconi offers the faeries in both faerie and more of a human form. The dichotomy between the two is extremely helpful in making them more relatable to the reader, in that it allows Cicconi the chance to give them characteristics that the reader can latch onto. All the characters are drawn with a seemingly light touch as Cicconi uses thinner, more refined linework. There's quite a dizzying array of panel layouts and designs all of which feed to a frenetic sense of pacing. Swan's colors are good in helping to give the faerie world an extra sense of magic and wonder. 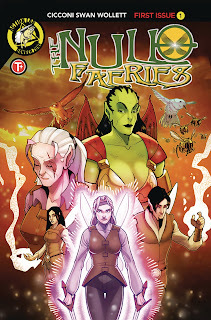 Null Faeries #1 is a fun take on a seemingly innocuous and innocent group of magical creatures. Ionantha was (and is) a fierce warrior who continues to provide advice to a society that never dies. Cicconi's script is full of dialogue that infuses their society with purpose and treachery. Cicconi's artwork is up to the task of presenting the faeries mingling with the human world in a way that feels appropriate. Null Faeries #1 is worth a read if you're looking for a new take on faeries. Null Faeries #1 is available now.